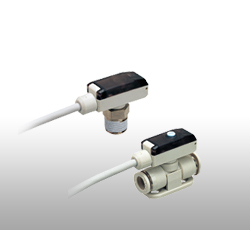 Sensor head is measured 24.5 x 10 x 10 mm and comes with union fitting, plug-in stem or male thread. Switch output or analog output in positive pressure range, negative pressure range, or compound pressure range sensor make 6 different types of out put specifications are available. Standard cable length is 3 meters. Analog Output Current 1 mA max. 1 mA max. 1 mA max. 1 mA max. Hysteresis (Switch Output) Fixed to 1% of F.S. Fixed to 2% of F.S. Fixed to 2% of F.S. Fixed to 2% of F.S.